The Greenwich Collection from Mirrotek brings to your home a line of beautifully elegant over the door, full length mirrors with a timeless, contemporary style. Each mirror in the Greenwich collection is made to last a lifetime being made from a durable particle board frame with strong and sturdy metal brackets to hold the mirror on your door, meaning this piece will be a fixture in your home for years to come. The Greenwich collection is designed with a timeless, contemporary style in mind that is highlighted by the simple, yet elegant shape, and clean lines that make this mirror a welcome addition to any home. There are a variety of beautiful finish options available in the Greenwich collection. The Greenwich full length mirror measures 14″W x 1.5″D x 48″H with a weight of only 7.5lbs. to perfectly fit a variety of door spaces in your home. This piece requires no assembly. For installation, simply hang the mirror on your bedroom or closet door. This piece is proudly brought to you by Mirrotek, an American manufacturer Since 1942. We proudly manufacturer, pack & ship each of our designer products in the USA. We offer a vast selection of dressing mirrors, accessories, clocks, gifts and more. 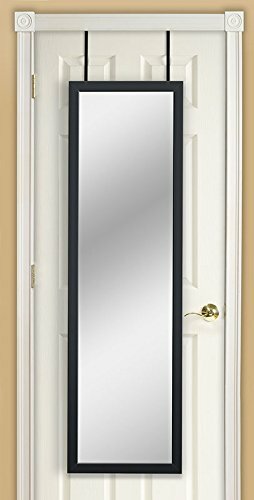 We stand behind each of our products and we know you will be completely satisfied with our home products.PERFECTLY SIZED TO FIT YOUR DOOR: The Full Length Over The Door Mirror From The Greenwich Collection Measures 14″W x 1.5″D x 48″H and Weighs Only 7.5lbs. To Perfectly Fit Over Your Bedroom or Closet Door. No Assembly Required, Just Hang Over Your Door To Install. MADE TO LAST A LIFETIME IN YOUR HOME: The Greenwich Collection Over The Door Mirror Is Built To Last Being Made From A Durable Particle Board with Strong and Sturdy Metal Bracket To Keep This Piece In Your Home For Years To Come. STYLISH, CONTEMPORARY DESIGN: The Greenwich Collection Is Designed To Stylistically Fit Any Bedroom With It’s Simple Shape and Clean Lines That Are Timeless. This Mirror Features A Beautiful Black Finish That Makes This A Welcome Addition To Any Home. OPTIONS TO CHOOSE FROM: The Greenwich Collection Of Over The Door Mirrors Comes In A Variety Of Finish Options Including Cherry, Oak, White, Black, Green Marble, Toile, Hounds Tooth, and Floral. PURCHASE WITH CONFIDENCE: An American Manufacturer Since 1942. We proudly manufacturer, pack & ship each of our designer products in the USA. We stand behind each of our products and we know you will be completely satisfied with our home products.